You can attend our classroom session as a 14-year-old. However, you cannot start driving lessons until you are 15 and have your permit. We recommend that 14-year-olds be within 6 months of their 15th birthday so the classroom information will be somewhat recent when you take the written test for your permit. No, not for the classroom. You must have acquired your permit for the behind-the-wheel training. Simply register online or by calling us. Pay the registration fee deposit or in full to secure you spot. Is there a benefit to taking the full-course rather than individual hourly instruction? For licensed drivers 15-24 yrs of age completing a state-certified driving school course can reduce your insurance premiums by presenting a copy of the course completion certificate to your insurance company. Therefore, the full course would in most cases eventually pay for itself in reduced premiums for younger drivers. Yes, but we prefer you not just in case the class is full. We normally hold classes one Saturday a month in Florence, North Myrtle Beach & Summerville and on some teacher workdays. Once school is out, we may schedule them more frequently as necessary. All classroom schedules will be posted on this website. Students may attend the classroom session out of their region if the date works better. For example, a Florence student can take the classroom portion in North Myrtle Beach and do all the driving sessions in Florence. Can I transfer my monies from one classroom session to another? Any student with an outstanding balance may transfer from one classroom session to another if done with more than 7 days notice of the classroom session. Any transfer within 6 days or less may transfer and will be assessed a $10 fee. A second transfer is $50. Any no-shows for class that have made a deposit will be assessed a $35 no-show fee that must be paid before transferring enrollment to a future class. Any no-show that has not notified us regarding transfer of deposit within 30 days will forfeit the deposit. Please bring your beginner's permit. We want you to have an enjoyable time. Other than expecting your full attention and discipline, you must turn cell phones off. Also, you are not allowed to smoke during class or breaks even if your parents allow you to. That is entirely up to you. Our software allows for "self-scheduling" so when you begin depends on your registering for a "behind the whheel" session within your account. What is the advantage to taking the full-course rather than individual hourly instruction? For licensed drivers 15-24 yrs of age, completing a state-certified driving school can reduce your insurance premiums up by presenting a copy of the course completion certificate to your insurance company. Therefore, the full course would in most cases eventually pay for itself in reduced premiums for younger drivers. Check with your insurance company for reduction details. Students and/or parents that need to cancel a behind the wheel (BTW) session can do that within their student account or by calling during business hours. Should you call after business hours please leave a detailed message regarding the cancellation as our instructors will need to be notified. We highly recommend that cancellations be done within your account. Cancellations and reschedules must be done within 24 hour of scheduled appointment. Should you cancel a behind the wheel session with less than 24 hour notice your account will be assessed a $35 non-cancellation fee. Deposits for the teen driving course are non-refundable but can be transferred to a future class with a 7+ day notice prior to registered classroom session. Any no-shows for class that have made a deposit will be assessed a $35 no-show fee that must be paid before transferring enrollment to a future class. Any no-show that has not notified us regarding transfer of deposit within 30 days will forfeit the deposit. Any deposits for adult training may be refunded in full minus a $15 processing fee if done with more than 24 hours prior to appointment. Any refunds for teen driving courses may be refunded minus a $15 processing fee except the $50 non-refundable deposit. Any monies paid that has not been used after a 6 month period will not be refunded. Yes. Current students who have completed the classroom and behind the wheel sessions can purchase additional hours at a discounted rate. Adults and/or students who need just behind the wheel training will find that info under "Packages-Adults"
Yes, for the driving sessions (not the classroom session) as long as it is in the local area. If you are outside of our local area and would like pickup/dropoff please call us to arrange for a fee. 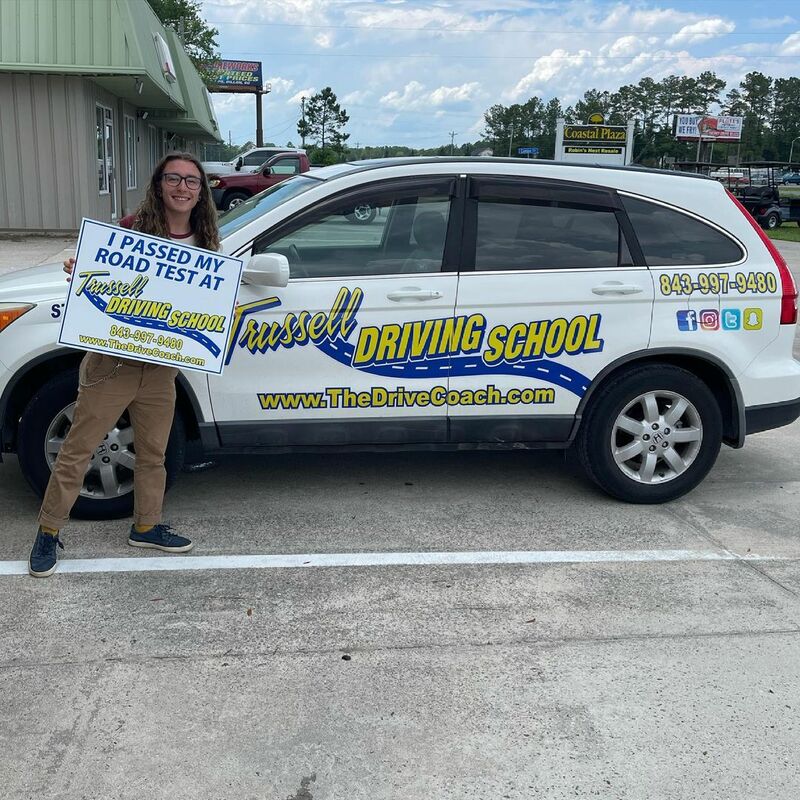 The required behind the wheel driving sessions or all behind-the-wheel (BTW) in which the student does the driving are all scheduled by the parent/student within your own student account or by calling Trussell Driving School. How long will it take to finish the BTW lessons? That depends on your wishes, your availability, and our schedule. If the student is ready for his road test, we MAY be able to finish him/her in a short time span. If a student has limited driving experience, we would prefer to spread out his/her lessons so they can practice what they have learned with a parent. Can a parent or friend ride in the backseat during the lesson? No. We need the student's full attention and do not want the distraction of someone in the backseat talking to the student. What if I forget about a lesson or have to cancel? Schedule appointments can be cancelled if done with more than 24 hours notice. If you do not cancel and we show up for a scheduled appointment and you are not available, a $35 non-cancellation/no show fee will be assessed and must be paid prior to the next session. South Carolina law does not allow driving schools to make that guarantee. Nonetheless, our students have an excellent track record. We will do the best job possible with your young adult, but driving is like everything else - some people pick it up quicker than others. When the student has completed her/his training, we will advise you on whether or not we think the student is ready for their test, and, if not, what they need to work on. Too often, teens are in a hurry to attempt their road test "just to see what it's like", as we often hear. For their own safety, they, and you, need to feel confident of their ability to drive. Their life may literally depend on it.